Miscarriage grief is something the Manns are all too familiar with after the loss of three unborn babies. Tommy Mann's new book Asleep in Heaven's Nursery shares both from the Mann's story and the lessons they learned along the way. In this interview he shares pieces of their story, their grief and their hope. First, tell us a about your story and the miscarriages you and your wife experienced. Alicia and I were married in January of 2006, and in May of 2007 we discovered that she was pregnant. We were living in Fort Worth, Texas, but we were just weeks away from moving back to my hometown of Orlando, so we were just going to wait and find a doctor in Florida. But after my wife started bleeding we went to a doctor in Texas and found out that she had lost the baby. We made an appointment with a doctor in Orlando to have a D&C, and once we got there we discovered that she was still pregnant. A few weeks later the bleeding started again, and after a trip to the ER, we confirmed that there had been a miscarriage, and a D&C was performed the following week. In December she found out that she was pregnant again. We didn't tell many people this time because the doctor said we would have trouble carrying a baby to term because of Alicia was diagnosed with a septated, undersized uterus. This pregnancy also ended in miscarriage. In July of 2008 we lost our third child to miscarriage. This time we were in South Carolina, where I had become the pastor of students at a church. We were with a group of church kids at Chuck E. Cheese's when the process began. 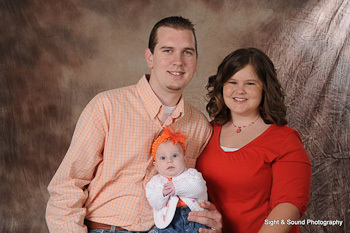 In September my wife conceived a fourth time, and against all odds she delivered our daughter Reagan on May 20th, 2009. Alicia found out she was in chronic kidney failure in the twelfth week of pregnancy and told to have an abortion. We refused, and then embarked on a long journey that consisted of 3-4 doctor visits per week, but it was certainly worth it. How was the miscarriage grief different for you and your wife? For my wife there was a lot of blame. She knew it was her uterus that caused the problems, and she felt responsible. I knew that the Lord created her body, and that He never makes a mistake. For me, I just wanted to be a father, and I struggled with thinking that would never happen. I tried not to show it because my wife blamed herself and thought I was disappointed with her, but that was never the case. Tell us something about the emotional experience when each successive miscarriage happened. The first miscarriage felt like a nightmare. I thought I could wake up the next morning and it would not have happened. We also had to deal with the well-intentioned comments from everyone who tried to cheer us up. The second miscarriage was almost our secret. Very few people knew, which helped in a way, but we also had to act like nothing had happened, which makes grieving difficult. The third was the worst for me. I gave up, and accepted the fact that we would not have biological children. We began to look into adoption until we found out about the 4th pregnancy. God is so good that even when I had given up He was still willing to bless us. What is it like as a husband trying to be supportive of your wife's grief and yet experiencing your own deep sense of loss? This was very difficult. In the first chapter of the book I describe that ride home from the Orlando ER begging God to give me the strength to not cry. I was devastated, but my wife asked me to be strong for her. To me that meant don't cry. She could handle the loss as long as she didn't see how much it hurt me. I shed many tears, but rarely in front of her. Instead, Ifound comfort in telling the Lord how I felt. Jesus said that His Spirit would give us comfort when we need it, and I found that to be true. Miscarriage grief is often referred to as a hidden grief as it seems less acknowledged and understood in society. What was your experience like? It was hidden. But we were blessed to have other older couples in our church who had gone through it. It helped to know I was not alone. I searched for a book that might answer the questions that I had, and was disappointed to not find one. The more research I did I discovered how common this whole thingis; 1 in 3 pregnancies end in loss, and yet no one was really talking about it. There are books for divorce care, weight loss, and anything else you can think of, but child loss seemed to be a taboo subject. It seemed that people were just expected to get over it and move on, but I had a hard time doing that. Where did you find the support in dealing specifically with the miscarriage grief? First and foremost, I found my strength in Jesus. He never promised us an easy life, but He did promise that He would be with us through the hardships. Our good life will come in heaven. He also put people in my path who had been there, and they showed us tremendous love. I also found strength in realizing that my children were in heaven. They didn't become angels, like many suggest, neither did they cease to exist. The more I studied the more sure I became that I would meet these children in heaven, and that in the mean time, they are asleep in heaven's nursery. What advice would you offer to others who might be in the midst of miscarriage grief? Hold on. There is light at the end of the tunnel, even if all you see is darkness. I don't expect you to forget your child, but with time you will experience some level of healing. Tell us about your book, how it came about and what is offered in it. Asleep in Heaven's Nursery opens by telling our story of our losses, along with all the medical problems our daughter had after birth. I included some personal things that were difficult to disclose, but I want the reader to know that I have been there. After our daughter was discharged from the NICUI felt that the Lord was leading me to write this book as a way to help others. When is a life considered a life? Will I see my child again? What will my child look like in heaven? Can I be forgiven for my abortion? Is adoption really a good alternative to abortion? Is abortion ok to save the mother's life? I also included testimonies from people who lost children to stillbirth, abortion, and a medical complication after 99 days. As the founder of a not for profit ministry, I don't make any money off of this book. It really was written as a way tooffer help and hope to those who need it.